Expert care and the support of family and friends gave her a second chance. Debra Wynn had DIEP Flap reconstructive surgery. Debra Wynn’s breast cancer had been in remission for almost two years when her doctor discovered that it had returned. When she heard the news, she was nevertheless at ease. Led by her strong faith, and thanks to the support of her husband, family, and friends, she faced a second round of treatment resolved to make the right, informed choices for herself and her future. The vast majority of patients diagnosed with breast cancer have the option of conservative therapy—a “lumpectomy” to remove the cancerous tissue, followed by radiation therapy, which is mandatory. This option allows the preservation of breast tissue with usually only minor long-term effects due to the radiation. Should the cancer recur, in most cases radiation is no longer an option and a mastectomy— complete removal of the breast tissue—is the recommended procedure. Following her diagnosis and surgery in 2009, Debra Wynn had undergone about 46 radiation treatments. The effect of radiation on the breast skin can be unpredictable, but Debra still had several reconstructive options available to her. Her doctor recommended a meeting with Dr. Cliff Cannon of Cannon Plastic & Reconstructive surgery in order to discuss those options. Following a mastectomy, there are several options for reconstruction, including tissue expanders (otherwise known as implants). TRAM and DIEP flap surgeries are more complicated, but both replace the sacrificed breast with the patient’s own tissue. The DIEP flap is a complicated microsurgery that replaces breast tissue with skin and fat taken from a woman’s belly. Importantly, the procedure preserves the muscle in the abdomen, creating a healthy breast of “own” tissue in greater than 95% percent of all cases. Dr. Cannon re-made Debra’s breast, at the same time performing a tummy tuck… but surgery was just the first step. The success of DIEP flap reconstruction is assured not just by the surgeon’s skill in the operating room, but also thanks to superior post-operative care. Strict, in-hospital monitoring in the first 48-hours is required to ensure the viability of the new breast. Thereafter, Dr. Cannon and his team keep a very close watch on their patients. Debra’s reconstruction did more than just succeed—the stem cells in the fat that was transferred to the breast site actually helped rejuvenate the skin envelope, which had been somewhat damaged by radiation therapy following her first diagnosis. One year later, Debra Wynn is doing sit-ups again—about 25 a day—walking a mile a day on the treadmill and she is ready to get back to running. She remains grateful for the devoted support of her family, including her sister and her son, Jay Jackson. She also relied on the support and prayers of her church family, led by Drs. 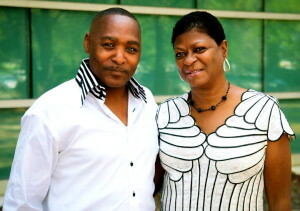 Larry and Mary Murray of Fellowship of Love Outreach in Jesup, Georgia.